Mill Creek, led by Georgia Tech commitment Luka Karaulic, was awarded the victory when the second round was rained out at Sunset Country Club in Moultrie. The Hawks shot 13-over, with Karaulic shooting 71, J.T. Smith shooting 74 and Zach Mullett adding a 76. Mill Creek won by a shot over Colquitt County and four over Milton. Tanner Brown of Colquitt County was medalist with a 70. 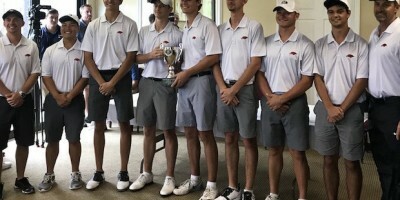 North Gwinnett rallied from an 11-shot deficit to defeat Mill Creek by one shot and defending champion Lambert by three at Spring Hill Country Club. The Bulldogs, who shot 47 over, got a 79 from Ahra Ko and an 83 from Alice Acosta in the final round. Jenny Bae of Collns Hill was medalist at even-par 144. Class AAAAAA: Starr’s Mill successfully defended its title with an eight-shot win over McIntosh at Planterra Ridge. Medalist Luke Phillips shot a 1-under 143 to lead the Panthers. Hogan Ingram of Rome and Isaac Samples of Walnut Grove tied for second at 144. Class AAAAA: Johns Creek made it three in a row by winning the title at Jekyll Island’s Pine Lakes Course. Andy Mao (1-under 143), Nic Cassidy (144) and Devin Patel and Preston Topper (both 145) led the Gladiators. Creekview finished second, with Jack Vajda sharing medalist honors at 5-under 139 with Greenbrier’s Austen Heider. Gainesville finished third. Class AAAA: Columbus won its third straight state championship when Tuesday’s second round was washed out at Achasta Golf Club. The Blue Devils ended up with a two-shot win over St. Pius. Ben Carr was medalist with a 67 and Jonathan Parker was second with a 67. Class AAA: Westminster beat rival Lovett at Cateechee Golf Club. Medalist Sam Lape had rounds of 71-72 and was medalist at 1-under 143. Drew Lingle added a 147 and Walker McPhail had a 153. Lovett’s Robert Ghirardini shot 146 and finished fifth. Tyler Lipscomb of Bremen was second at 144. Class AA: Metter, led by Ian Glanton’s final-round 77, came out on top at Applewood Golf Club. Metter won by 15 shots over Vidalia, which got rounds of 73-71 from medalist Jackson Toole. Class A Private: Bailey Means and Cannon Crane shot 3-under 141 at Heron Bay to lead Holy Innocents’ to the championship. Defending champion First Presbyterian Day was 10 shots back. Parker Rostowsky of Mt. Paran Christian and William Sluder of Brookstone shared medalist honors at 5-uner 139. 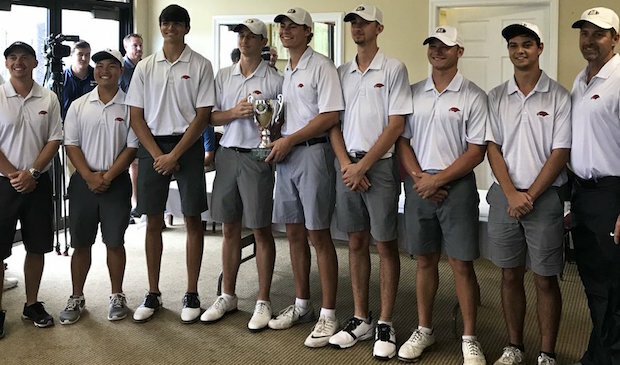 Class A Public: Gordon Lee’s Tucker Windham shot 74-69 to finish at 1-under 143 and lead the team to its second straight championship at Double Oaks Golf Club. Windham shared medalist honors with Thad Clark of Schley County and Ryan Smith of Lake Oconee Academy. Smith had a final-round 67. Gordon Lee’s Gray Weldon was fourth and Jacob Carlock placed sixth. Class AAAAAA: Northview, led by medalist Christyn Carr, who shot 8-over 152, and runner-up Michelle Cao, who was one shot back, won the title by four shots over defending state champion Johns Creek. The Gladiators’ duo of Amy Ng and Kate Song tied for third with Dalton’s Katelyn Skiffen at 11-over at Jekyll Island’s Indian Mounds course. Class AAAAA: Defending champion Starr’s Mill lapped the field with a 27-shot win at Braelinn Golf Club. Liza Eubanks was medalist at 7-over 151, seven better than runner-up Sutton Rollins of Ware County. Mary Hunter finished fourth and Ellie Camp was seventh for Starr’s Mill. Class AAAA: Woodward Academy won the championship when the second round could not be completed at Innsbruck. The War Eagles counted a 75 from Ayanna Habeel, a 77 from Morgan Ellison and an 80 from Teagan Fritts. Catie Craig of White County was medalist at 2-over 74. Class AAA: Rutland scored a two-shot win over Bremen at Cateechee Golf Club. Rutland used a 7-over 151 from Eujin Pyon and a 9-over 153 from sister Carroll Pyon. Bremen was led by Christian Williams at 156. The medalist was Tori Owens of Murray County at 5-over 149, including a final-round 71. Class AA: Medalist Rin Richardson had rounds of 80-79 and co-runner-up Emma Saunders shot 80-83 to lead St. Vincent’s to the championship. Bleckely County second behind Brooke Krieg, who tie for second. Class A Private: Darlington finished first, with Sophia Kalusche finishing second and Liza Frisbee placing fifth. Runner-up Brookstone finished second. Landmark Christian’s Cameron Daniel was medalist at 4-over 148, enough for a one-shot victory. Class A Public: Lake Oconee Academy won its first state championship at The Preserve at Reynolds Lake Oconee. LOA finished at 33 over and beat Commerce by 10 shots. Katie Scheck shot 74 and Emma McCord shot 91 o the final day. Scheck was medalist at 3-over 147.